Don’t say you couldn’t fancy the Chocolate Hazelnut Torte as a special treat? Gourmet magazine tell us that this Chocolate Hazelnut Torte Recipe “…… is a masterful mix of textures: The top crust bakes up with a hint of crackly crunch, giving way to a moist, light interior studded with tiny bits of hazelnut.” That has already got my tastebuds going! This Chocolate Hazelnut Torte recipe sounds absolutely delicious. Writing up a recipe from an American magazine causes all sorts of problems, because the contents are different. This recipe was for the Jewish Passover, hence the use of potato starch, found in ethnic shops. Corn flour is the substitute. Also, the weights were in so many different calculations, but I've tried to give the equivalents for them all. But I would try this out first for yourself, and see it is perfect. That's what I'm going to do before I cook it to share with friends. I'll put my findings back on the recipe (and probably enjoy eating loads of good cake with Erik.) To serve, you could also add a tiny grating of dark chocolate over the icing sugar, and it would be brilliant partnered with some fresh raspberries or some Creme Fraiche, of, my choice, very good and creamy Vanilla Ice Cream. Have a play, and enjoy the result. Half cup (112g) unsalted butter plus additional for greasing pan. 6 oz (180g) fine-quality bittersweet dark chocolate (not unsweetened: not more than 60% Cacao. 4 large eggs, separated at room temperature for 30 mins. Generously butter bottom and sides of 24cm (9 - 91/2 inch) springform cake pan. & line bottom with a circle of baking parchment paper..
Toast hazelnuts in a shallow baking pan in oven, shaking pan once or twice, until nuts are golden for approx. 12 minutes. Place nuts in a kitchen towel and rub off any loose skins while nuts are still warm, then cool nuts completely. Reduce oven temperature to 165C / 145 F / 325 F / Gas3. While nuts cool, melt butter and chocolate together in a heatproof bowl, set over a pot of simmering water (don't let bottom of bowl touch water). Whisk together yolks and 2 tablespoons sugar in a large bowl. Gently whisk in chocolate mixture, then add nut mixture and vanilla and whisk gently until combined (mixture will be slightly grainy). Beat egg whites with a pinch of salt in another bowl with an electric mixer at medium speed until they hold soft peaks. Add remaining 2 tbsp sugar a little at a time, beating, and beat until whites just hold stiff peaks. GENTLY fold one fourth of whites into chocolate mixture to lighten, then fold in remaining whites gently but thoroughly. Pour batter into springform pan, then bake until a pick or skewer inserted into centre comes out with a few moist crumbs adhering, approx 35-40 minutes. Transfer to a rack and cool completely in pan, about one hour. Run a knife around the edge of the torte, then remove the side of the pan. To Serve: Dust with finely sieved icing sugar. Tip: Torte can be made a day ahead, cooled completely in cake pan, then cover with cling film. Turn out as specified and decorate. 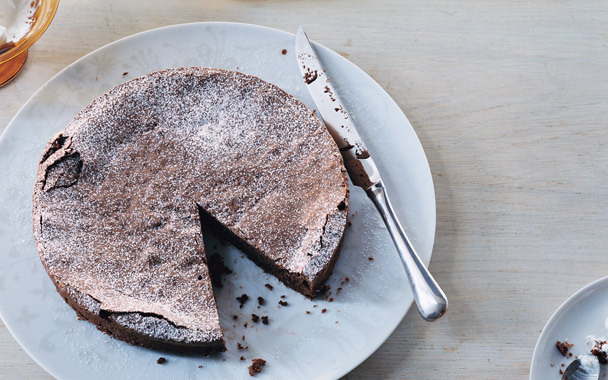 Well, this Chocolate Hazelnut Torte recipe is certainly a chocolate cake with a difference. The way of making it is unusual, the ingredients also unusual, so the real proof of the pudding will be in the eating. If it turns out as good as the picture above, and the description from Gourmet, I will be well pleased. So watch this space for an update on the Chocolate Hazelnut Torte recipe. Hopefully it will have lots of ticks. Kitchen Garden – It’s getting closer!